FIGURE 2.2 Other signalling pathways. GPCRs can also trigger the activation of other signalling pathways such as the ERK/MAPK and JNK pathways, which leads to the induction of transcription factors. of the STAT (signal transducer and activator of transcription) transcription factor.19 In this case, the angiotensin 1A receptor interacts through its C-terminus with JAK2 (Janus kinase). 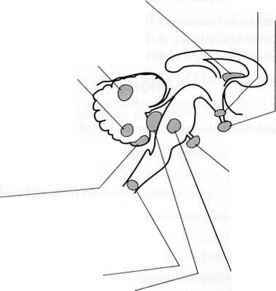 Several other examples demonstrate interactions of GPCRs and cellular proteins. Typically, the interaction of p2-adrenergic receptor and the NHERF1 and NHERF2 sodium-hydrogen exchanger regulatory proteins is mediated by PDZ2021 Metabotro-pic glutamate receptors such as mGluR7 also can interact with PDZ-domain-con-taining proteins.22 The biological and pharmacological significance of non-G protein signaling is probably to function as a means to enhance the specificity of GPCR signaling. It may also allow distinct physiological functions of two different GPCRs otherwise activated by the same ligand and coupled to the same G protein. An important fairly recent phenomenon observed for the signal transduction of GPCRs is the dimerization of receptors.26 In case of signaling through receptor tyrosine kinases, for dimeric receptors each monomer can phosphorylate the other monomer during ligand-stimulated autophosphorylation to achieve a fully active state of the kinase. GPCR dimerization is described in more detail in Chapter 15. FIGURE 2.3 Trafficking of GPCRs. 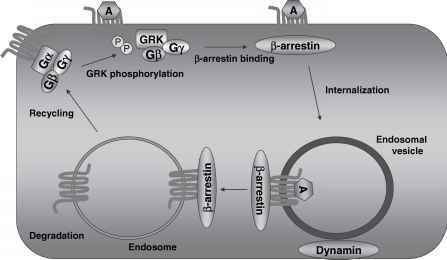 Upon agonist activation, GPCRs are internalized in endosomes with the aid of p-arrestins. Depending on the receptor, they are either recycled to the plasma membrane or subjected to degradation.